RIYADH, 6 March 2007 — A globetrotting man on a mission to promote peace and love is currently visiting Saudi Arabia. He will be the first to perform Umrah after traveling on a motorbike across 18 countries. He is none other than Jeffrey Polnaja, the daring Indonesian biker. “My mission is dedicated to world peace, to strengthen people-to-people ties and to show to the world that Muslims are not terrorists, rather they strive more for peace and brotherhood,” said Polnaja immediately after his arrival in the Saudi capital from Qatar. “I am waiting to meet and convey my regards and greetings to Prince Sultan ibn Fahd, chief of the General Presidency of Youth Welfare (GPYW),” said Polnaja, while speaking to Arab News. He also thanked the local Marriot Hotel for sponsoring his stay and the Indonesian mission for facilitating his trip. Polnaja is riding across more than 45 countries on his first leg, covering a distance of more than 330,000km. He will be riding his bike to visit the holy cities of Makkah and Madinah during his two-week stay in Saudi Arabia. Polnaja is the first Indonesian biker to explore the world on a motorcycle. On his German-made 1150cc BMW adventure bike, especially designed for long journeys and difficult terrains, Polnaja, 44, has already covered 18 countries including Singapore, Malaysia, Thailand, Cambodia, China, Bangladesh, Nepal and India. The “Ride for Peace” would last five years and Polnaja would visit about 100 countries in five continents. “Saudi Arabia is the 19th country on my list,” said the biker. The second stage will take him across America and Australia. 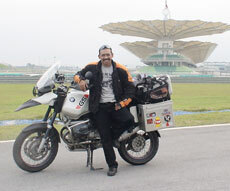 Polnaja began his peace ride on April 23 from the Indonesian capital, Jakarta. His bike weighing 400 kilograms including 120 kg of provisions parked at the Indonesia Embassy is equipped with necessary high-tech gadgets including a global positioning system, a video camera, and extra containers for tools and supplies. Asked about a few memorable moments of his journey, the daring biker said he was shot at from a mountaintop in a country he does not want to name. “But later, those who opened fire realized that he was an Indonesian on a peace mission,” said Polnaja. In another incident, he was robbed off $12,000. Polnaja had to go through several hurdles during his journey, but he has not lost heart and courage. His family, especially his 17-year-old son, inspired him to embark on this arduous journey. Riding eight hours a day, rain or shine, Polnaja has passed through most exotic places. His all-condition-jacket protects him from extreme weather and a special heating gadget installed in the handlebars keeps his hands warm in freezing winds. “I repair the bike myself if it breaks down. I have slept on roadsides when there were no settlements in sight. Sometimes in rural areas, people offered me to stay with them,” said Polnaja. He takes pictures as he rides with a camera fitted to his bike, while the global positioning system guides him through towns, cities and countries. Polnaja, during his ride from Jakarta to Riyadh, has covered 52,000km so far, and will end the first half of his journey in Europe in 2008. His motorbike has already consumed about 5,000 liters of gasoline. Before returning to his family in Jakarta, he will book his bike on a plane for Alaska, North America. In 2009, he will fly to Alaska to begin the second leg of his tour, heading toward South America.